After the Romans had established a permanent occupation of Britain, the defence of the coast was reduced to a system. Where-ever the Romans conquered, they organized, and by their wise arrangements became preservers and benefactors. It is generally supposed that Richborough and Reculver were Roman forts as early as the time of Claudius, but that other castles on the coast were of later date, being for defence against the Saxon pirates of the third century. At this period there was a high military officer called Comes Littoris Saxonici per Britanniam, the Count of the Saxon Shore in Britain. He was the commander of all the castles and garrisons on the coast of Norfolk, of Essex, of Kent, of Sussex, and of Hampshire. These coasts formed the Saxon Shore. Sir Francis Palgrave thinks that the name was derived from the Saxons having already here made settlements. Others believe that the Saxon Shore was so called from its being peculiarly exposed to the ravages of the Saxons, to resist whom the great castles which stood upon this shore were built or garrisoned. These castles were nine in number; and, although in one or two particulars there are differences of opinion as to their sites, the statement of Horsley is for the most part admitted to be correct. In Essex there was one fort, Othona (Ithanchester, not far from Maiden), over which the sea now flows. In Kent there were four castles thus garrisoned and commanded: Regulbium (Reculver), Ritupæ (Richborough), Dubræ (Dover), and Lemanæ (Lymne). The remains of this last of the Kentish fortresses are now very inconsiderable. Leland, however, thus describes it:—“Lymme, hill of, or Lyme, was some time a famous haven, and good for ships, that might come to the foot of the hill. [The river Limene, or Rother, formerly ran beneath the hill.] The place is yet called Shipway and Old Haven; farther, at this day the Lord of the Five Ports keepeth his principal court a little by east from Lymme Hill. There remaineth at this day the ruins of a strong fortress of the Britons hanging on the hill, and coming down to the very foot. The compass of the fortress seemeth to be ten acres. The old walls are made of Britons’ bricks, very large and great flint, set together almost indissolubly with mortars made of small pebble. The walls be very thick, and in the west end of the castle appeareth the base of an old tower. About this castle in time of mind were found antiquities of money of the Romans. There went from Lymme to Canterbury a street fair-paved, whereof of this day it is called Stony Street. It is the straightest that ever I saw, and toward Canterbury-ward the pavement continually appeareth for four or five miles.” Such is Leland’s account, three centuries ago, of a ruin which since that period has more rapidly perished from the subsidence of the soil upon which it stands. 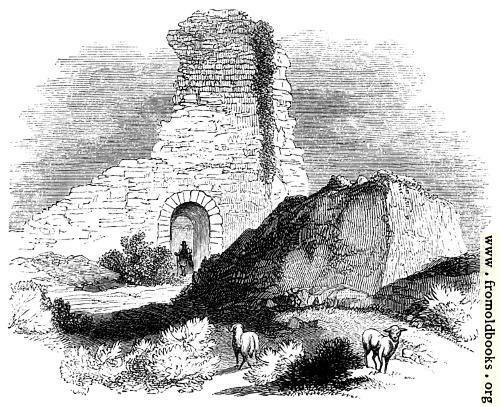 Lambarde, who wrote half a century after Leland, says of Lymne, “They affirm that the water forsaking them by little and little, decay and solitude came at the length upon the place.” There is the gate-house of a later building than the Roman walls still remaining, built of large bricks and flints, as the tower of the neighbouring church is built. These may contain some of the ancient materials. 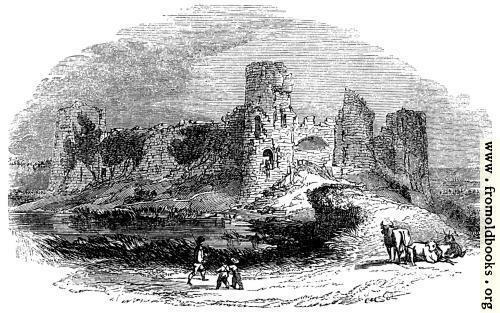 105.—General View of the Ruin of Pevensey Castle. 112.—Interior of Norman Tower, Pevensey. Anderida, the sea-fort of Sussex, is held by some to be Hastings, by others to be East Bourn. 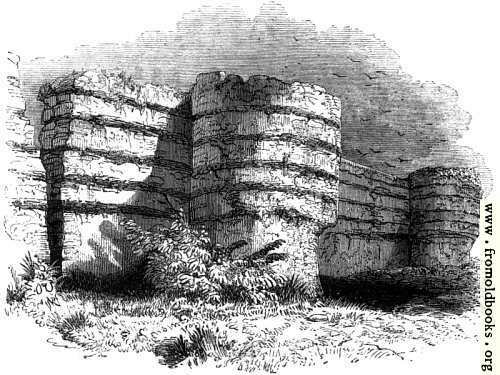 It is not our purpose to enter upon any controversial discussion of such matters; but it appears to us that Pevensey, one of the most remarkable castles in our country, which the Roman, and the Saxon, and the Norman, had one after the other garrisoned and fortified,—the ruins of each occupier themselves telling such a tale of “mutability” as one spot has seldom told,—was as likely to have been the Anderida of the Saxon shore, as Hastings and East Bourn, between which it is situated. Be that as it may, we proceed briefly to describe this remarkable ruin. The village of Pevensey is about equidistant from Bex hill and East Bourn. The approach to it from either place is as dreary as can well be imagined, over a vast marsh, with nothing to relieve the prospect sea-ward but the ugly Martello towers, which on this coast are stuck so thick that a second William of Normandy would scarcely attempt a landing. They now guard the shore, not against Williams and Napoleons, but against those who invade the land with scheidam and brandy. Rising gently out of this flat ground we see the Castle of Pevensey. It is, with very slight differences, situated exactly as Richborough is situated—a marsh from which the sea has receded, a cliff of moderate height rising out of the marsh, a little stream beneath the cliff. Here, as at Richborough, have the Roman galleys anchored; sheltered by the bold promontory of Beachy Head from the south-west gales, and secured from the attacks of pirates by the garrison who guarded those walls. We ascend the cliff from the village, and enter the area within the walls at the opening on the east (Plan 106). The external appearance of the gate by which we enter is shown in Fig. 107. This is held to have been the Prætorian Gate. The external architecture of the gate and of the walls has evidently undergone great alteration since the Roman period. In some parts we have the herring-bone work of the Saxon, and the arch of the Norman; but the Roman has left his mark indelibly on the whole of these external walls, in the regular courses of brick which form the bond of the stone and rubble, which chiefly constitute the mighty mass. The external towers, which are indicated on the plan, are quite solid; some of these have been undermined and have fallen, but others have been carefully buttressed and otherwise repaired in very modern times (Fig. 108). Having passed into the area by the east gate, we cross in the direction of the dotted line to the south-western or Decuman Gate. This is very perfect, having a tower on each side. Going without the walls at this point, and scrambling beneath them to the south, we can well understand how the fort stood proudly above the low shore when the sea almost washed its walls. The ruin on this side is highly picturesque, large masses of the original wall having fallen (Fig. 105). On the north side was a few years since a fragment of a supposed Saxon keep, held to be an addition to the original Roman Castrum (Fig. 109). But the most important and interesting adaptation to another period of the Roman Pevensey is the Norman keep, the form of which is indicated on the Plan 106, at the south-east, and which was evidently fitted upon the original Roman wall so as to form the coast defence on that side. We purposely reserve any minute description of this very remarkable part of the ruin for another period. The ponderous walls of the Roman dominion are almost merged in the greater interest of the moated keep of the Norman conquest. 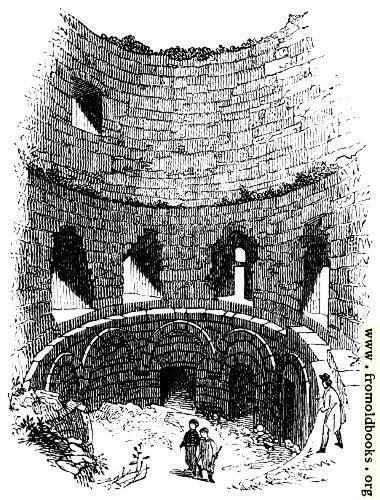 It will be sufficient for us here to present engravings of the Norman works (Figs. 110, 111, 112), reserving their description for another Book. The area within the Roman walls of Pevensey is seven acres. The irregular form of the walls would indicate that here was a British stronghold before the Roman castle. The one Roman sea-fort of Hampshire, Portus Adurnus (Ports-mouth), offers a striking contrast to the decay and solitude which prevail, with the exception of Dover, in all the other forts of the Saxon shore.